This week, I'll be making Spelt Challah for one of the loaves. I haven't found a recipe yet, so if you've got one that is great, let me know. I'm excited to try this ancient grain. Also, I just discovered this cute shape for Challah into Birds. I definitely want to try... aren't the darling? 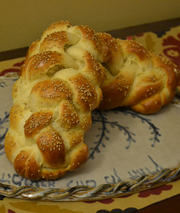 OMG, I HAVE to make those challah birdies. This week. Will send photos. THANK YOU!